At this time of year, I think many of us crave a huge scarf, big enough to envelop one from head to toe. While the gorgeous Mentolat Scarf isn’t quite that big, it’s a generous helping of love from Manos del Uruguay, knit in their Silk Blend yarn. WEBS has made it easy for you to knit this uniquely-constructed scarf by making a kit-our Mentolat Kit comes in 4 different colorways, each with 6 colors of Manos del Uruguay’s Silk Blend yarn. This DK-weight single ply blend of 70% merino and 30% silk is dreamy, both in color and texture. 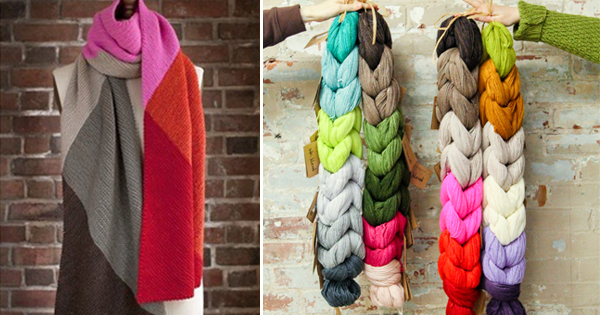 The kit provides you with 1500 yards, plenty to make the largest-sized scarf in your choice of color blocks. Since we’re officially at the tail end of the holiday season, this might make a great gift for a knitting friend who would rather DIY next year’s presents. Each kit comes with a free Mentolat Scarf pattern, making it a one-stop gift item, although frankly, I’d covet this for myself, and not ever give it away. This entry was posted on Friday, December 30th, 2016 at 11:00 am	and is filed under Products at WEBS. You can follow any responses to this entry through the RSS 2.0 feed. You can skip to the end and leave a response. Pinging is currently not allowed.